As a young lad, my family would travel to Colorado on a quest to visit family every August. 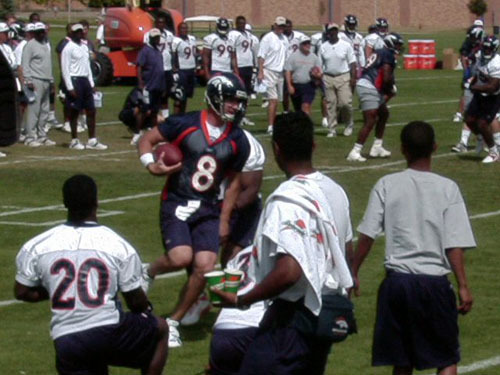 While the frequent stops at Runza (mini corndogs and fries) and Taco John's (6 tacos and potato oles) were well worth the travel time (by car), there was also another event that I always looked forward to: Denver Broncos training camp. 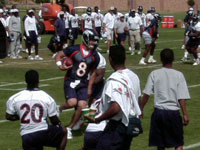 The camp was held in Greeley (I believe at the University of Northern Colorado), where the players stayed in the dorms, and the practices were free to view for the public. 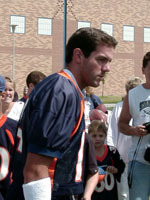 It was also a great place to get autographs, and there was a Taco John's very close to campus. Unfortunately, they have now moved training camp to Dove Valley. Normally an autograph line would form, and the team would select 5 guys to sign autographs each day (often one real player, one guy who was decent, and three guys who wouldn't make the team). My father and I frequently sat in this line during the practice because I loved autographs, but sometimes we would watch some practice first. I believe I was in elementary school at this time (the reasoning for which I will detail later), when my father and I were sitting behind the rope, watching the wide receivers run routes and catch passes from quarterbacks. However, one ball flew over the outstretched arms of Rod Smith, then in his first few seasons (I don't remember a specific year, but this pre-Super Bowls). The ball bounced a few feet away from me, where it stopped. After my dad urged me to go get it, I illegally broke the barrer of a tiny yellow rope and grabbed the ball. As Rod came over, he did not walk over to grab the ball. Instead, he stopped a few feet away from me and held up his hands, telling me to throw it to him. 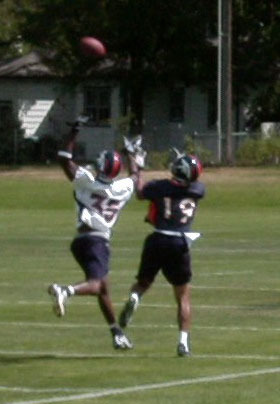 I threw one of my patented end over end passes (that I still throw to this day), and Rod instantly became my favorite player. 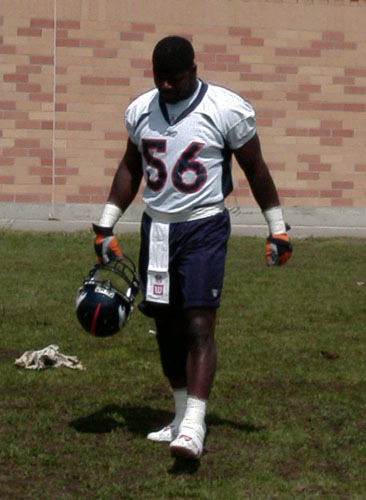 Surely it was fate that I, like Rod Smith, was born on May 15 (along with a slew of author notable athletes, such as George Brett, Emmitt Smith, and Josh Beckett). Now how do I remember the age range that I was at the time? Two reasons: First, I remember wearing my jersey to schools on the days before the Super Bowls. The other reason? Back in those days, my sister and I each got 40 dollars to spend on the two week trip. On this particular trip, I was going to spend 36 of my 40 dollars on a Rod Smith jersey. My father ended up splitting the cost with me, allowing me to purchase other assorted goods later (like my youthful fascination with buying rocks). 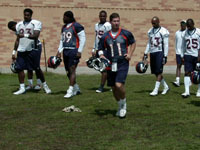 After that, I ended up with countless Rod Smith autographs, including a mini helmet, a mini-mini helmet, and a football. But it wasn't until later, as a partially grown pre-teen still wearing my jersey, that I was standing in a crowd getting autographs when none other that Rod walked over and signed my jersey. Afterward, my father and I surely celebrated at Taco John's. Property of Michael Welburn. Please address any questions or concerns to me via webmaster@michaelwelburn.com.